Today the VIX spiked 30.6% and closed over 22.00 (22.81) for the first time since the middle of February. While 22.81 is not the kind of number that suggests panic is in the air, it should be noted that since the VIX was officially launched in 1993, the VIX has spiked 30% in one day on only seven prior occasions. Those prior spikes were in the throes of some volatility events that posed serious systemic threats – or what I call structural volatility. Prior 30% spikes occurred at the height of the 2008 financial crisis (twice), during the 1997 Asian financial crisis and in the wake of the 9/11 World Trade Center attacks in 2001. In this context, the current threat to Europe in the form of deficit problems in Greece, Portugal and the rest of the PIIGS strikes me as a less significant structural risk, at least for now. Readers who have followed this blog for a long time will know that I am a proponent of fading most volatility spikes with short volatility positions such as short VIX options (e.g., calls and call spreads), short VIX futures, short VXX, short various index/ETF strangles and straddles, etc. In the 38 times the VIX has spiked at least 20% in a single session since 1990, the volatility index has been, on average, down 7% three days later and down 9% five days later. Approximately 75% of the time the VIX is down three and five days following a 20% one day spike. Even during the last three months of 2008, when the risk to the financial system was the highest it has ever been and stocks were on a steep downward trajectory, going long SPX/SPY on a 30% VIX spike was profitable for the 3-5 day holding period. Fading VIX spikes over a longer holding period is a little more problematic. Set aside the 2008 data and the long-term results of fading a VIX spike are extremely promising. Include the 2008 data, however, and the fat tails make a longer-term holding period into the teeth of a crisis an unprofitable venture. The bottom line is that whether this is a quick storm or the beginning of a major crisis, a 3-5 day holding period should provide a statistical edge. Of course, if you can be certain that a major crisis will not develop, then a longer-term holding period will generate larger profits. For those trying to put the fundamentals of the European debt situation and volatility risk into perspective, some time with A Conceptual Framework for Volatility Events and Forces Acting on the VIX may be helpful. Readers who are more interested in the numerical context of history may wish to study Elast-o-VIX and VIX Spike of 35% in Four Days Is Short-Term Buy Signal from the list below. 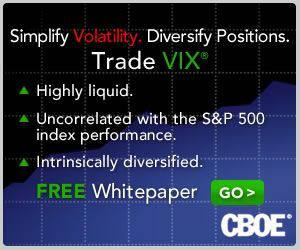 DISCLAIMER: "VIX®" is a trademark of Chicago Board Options Exchange, Incorporated. Chicago Board Options Exchange, Incorporated is not affiliated with this website or this website's owner's or operators. CBOE assumes no responsibility for the accuracy or completeness or any other aspect of any content posted on this website by its operator or any third party. All content on this site is provided for informational and entertainment purposes only and is not intended as advice to buy or sell any securities. Stocks are difficult to trade; options are even harder. When it comes to VIX derivatives, don't fall into the trap of thinking that just because you can ride a horse, you can ride an alligator. Please do your own homework and accept full responsibility for any investment decisions you make. No content on this site can be used for commercial purposes without the prior written permission of the author. Copyright © 2007-2017 Bill Luby. All rights reserved. What Is High Implied Volatility? The intent of this blog is to educate, inform and entertain readers, while also serving as an archived learning laboratory of sorts as I try to sharpen my thinking in areas such as volatility, market sentiment, and technical analysis. I also enjoy charging off on tangents and hope that readers may find some illumination or at least amusement in these forays. Chief Investment Officer at Luby Asset Management LLC in Tiburon, California. Previously worked as a full-time trader/investor and also a business strategy consultant. Education includes a BA from Stanford and an MBA from Carnegie Mellon. Useless trivia: I once broke the world pogo stick jumping record without knowing it.